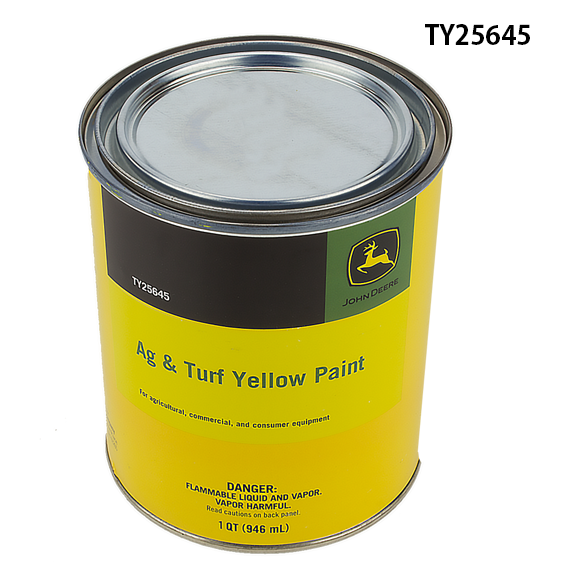 John Deere #TY25645 Turf Yellow Paint is a lead free enamel paint intended for agricultural, commercial, and consumer equipment, that is suitable for exterior or interior use. Produces a finish that sets up in minutes, is tack free in a few hours, and dries overnight to a hard, glossy film. Resists fading, cracking, and chipping. May be applied directly to metal, plastic, or wood without using a primer (John Deere primer is recommended for improved corrosion resistance).